HF Bloggers Round Table Review: Claude & Camille by Stephanie Cowell and Giveaway! "Sometimes he dreamt he held her; that he would turn in bed and she would be there. But she was gone and he was old. Nearly seventy. Only cool paint met his fingers. “Ma très chère . . .” Darkness started to fall, dimming the paintings. He felt the crumpled letter in his pocket. “I loved you so,” he said. “I never would have had it turn out as it did. You were with all of us when we began, you gave us courage. These gardens at Giverny are for you but I’m old and you’re forever young and will never see them.."
A vividly-rendered portrait of both the rise of Impressionism and of the artist at the center of the movement, Claude and Camille is above all a love story of the highest romantic order." The inspiration and the beauty behind Claude Monet's paintings have intrigued me for years. His impressionism style is a fantastically elegant thing that is really indescribable. When the news came that Stephanie Cowell was writing a novel about Claude and his lover Camille, I was so eager to get my inartistic hands on it. I had visited a Monet exhibit once in Las Vegas, and I am so glad I had the opportunity to go, but I wish I had spent a longer time there. Like for a few days, perhaps. But, the line moves you along and boom your $30 bucks is spent. 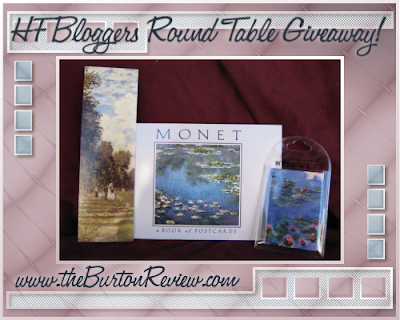 I just love his paintings and have for a long while, and I do own several Monet inspired gifty items. Beginning to read the new novel, I had the feeling of something like a secret was about to be revealed to me. I could only hope that it lived up to my high expectations, and that of others. And it did. I found the read to be very pleasurable as Stephanie Cowell took me on a journey through Claude Monet's life and into his heart as he struggled to reach his muse's heart. Claude first saw Camille at a train station, and the visual of her plagued him for four years until he found her again, where she defied her family and stayed with Monet. Instead of the somewhat tedious biography style type of read, the author Stephanie Cowell introduces Claude Monet to us as he is just another young man, struggling within the confines of a strict family. He is portrayed as the sensitive type, as expected, and is hurt badly when his mother dies. His father takes awhile to come around to Monet and to accept his artistic leanings, but we still empathize with the older man as he is forced to deal with the fact that his son will not be his father's shadow. We witness Monet's artistic tendencies as they develop and we meet some of the other famous painters of the time such as Renoir, Sisley and Bazille, and we learn of the struggles of the new impressionistic style of painting that he and his friends created. We are weaved through the story of Claude as he struggles and continues to struggle, for in the whole book it seemed there was not an easy time for Claude Monet. He traveled from rented place to rented place, counting on hospitality and charity.. and through it all, his dearest inspiration Camille stuck by him. Camille, the girl who was bred to be a fine lady, fell in love with the artist and his dreams, and indulged Claude endlessly. The two seemed made for each other and it was a wonderful story to read about as I felt I had gotten to know part of the real Claude Monet through this writing of Stephanie Cowell. I really enjoyed the small interludes the author inserted as the story briefly returned to Monet towards the end of his life, and I also felt that the author did well with the Parisian settings and the war. The imagery and visualization were quite palpable, as well as the utter despair and anguish that Monet repeatedly seemed to endure. Since I shared a love for the French language with my father, I enjoyed the snippets of French words that the author inserted. Most of the time when the words were inserted, the English translation followed directly after, so that we would not be distracted at all with the french words there. Although, merde was said a lot, and the translation was not there, but that was the one cuss word that I had learned when I was twelve, with the admonition that it was used for luck for entertainers. I really enjoyed learning about the life of Claude and Camille, and I wish that it had been easier for him and his artistic friends. 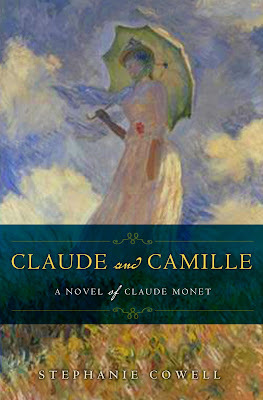 I can totally see where readers of Claude and Camille who are current artists would relate to the same artistic frustrations of Monet, such as painting light and shadows and landscapes that shift with the wind. For that reason, I would not hesitate to recommend this artists as they can feel a kinship with a great painter of the past. I also recommend it for those who would enjoy an equally heart wrenching and heartwarming blend of romance, history and art. Also today on the schedule is Author Guest Post w/sponsored giveaway at Historical-Fiction.com. Visit my guest post featuring the author, Stephanie Cowell, here, and find your chance to win your own hardcover of Claude and Camille with that post, open to everyone in the USA. THIS IS NOT FOR THE BOOK!! This is for the items in the picture! This is a special giveaway open to my current USA followers only. Tell me you are a Current Follower, and leave your Email Address. +2 Post the above Graphic on your blog's sidebar, linking to this post, leave the link to your blog. +1 Tweet this post, using the Retweet button at the top of the Post, leave a link to your tweet.